Identity and Cultural Diversity examines immigration and its effect on diversity from a social psychological perspective. Immigration increases cultural diversity and raises difficult questions of belonging, adaptation, and the unity of societies: questions of identity may be felt by people struggling with the basic problem of who they are and where they fit in, and although cultural diversity can enrich communities and societies it also sometimes leads to a new tribalism, which threatens democracy and social cohesion. The author Maykel Verkuyten considers how people give meaning to the fact that they belong to ethnic, racial, religious and national groups, and the implications this can have for social cohesion. The opening chapters consider the nature of social identity and group identification, and include discussions of identity development in adolescence, acculturation, and multiple and dual identities. Verkuyten then considers one of the most pernicious social problems: how conflict emerges from perceiving others as different. He examines when and why group distinctions grow into conflicts and considers the role of cultural diversity beliefs, such as multiculturalism and assimilation. The book concludes by exploring productive ways of managing cultural diversity. 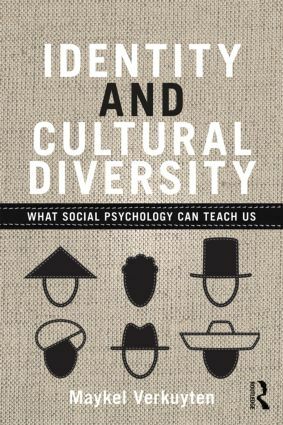 Written in an engaging style, Identity and Cultural Diversity will be essential reading for undergraduate and postgraduate students of social and cultural psychology and other social sciences, and it also makes key themes in social psychology accessible to a wider audience outside academia.